Here we are, still in Aitutaki, trying to tear... nay, to wrench ourselves away from this lovely little paradise in the middle of the South Pacific. We could happily stay a lot longer, but we need to move on to stay ahead of cyclone season. 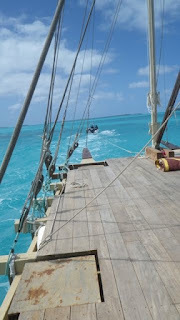 Intentions to sail today for Palmerston were delayed 24 hours to allow for the big seas to die down (the plausible public excuse) and also for, shall we say, "recovery" from the Mother of All Hootenannies at the Boat Shed Bar and Grill last night (the real excuse.) We did it all, from Edelweiss to Honky Tonk Woman; we sang, we laughed, we cried, we hugged, we ate, we drank. Especially the latter. These Aitutakians can sure throw a party. This morning Papa Rick, who I swear is channeling Ray Charles, and Tim, an excellent 5-string guitarist (who needs the sixth string anyway?) stopped by with some parting gifts: 3 ripe pawpaws (papayas), a bunch of bananas, a gigantic cabbage, limes and a special gift of a delicious Polynesian voyaging food called "ota." Sigh. They've made it even harder to leave, but leave we will, on the tide tomorrow. Really. 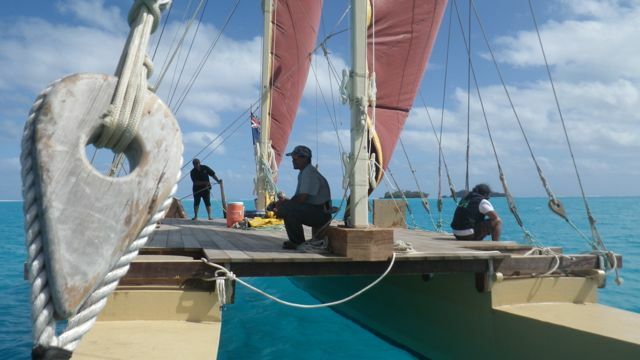 Meanwhile, let's post some of those photos of sailing this 74-foot amazing Polynesian double canoe. 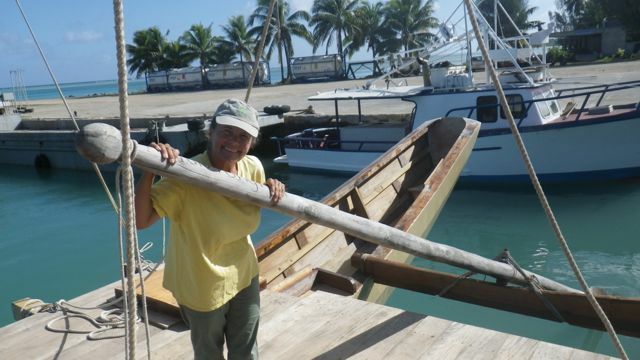 At the top is our friend Ken in the stern of Te Au O Tonga, the mother of all the other vakas currently sailing the Pacific. 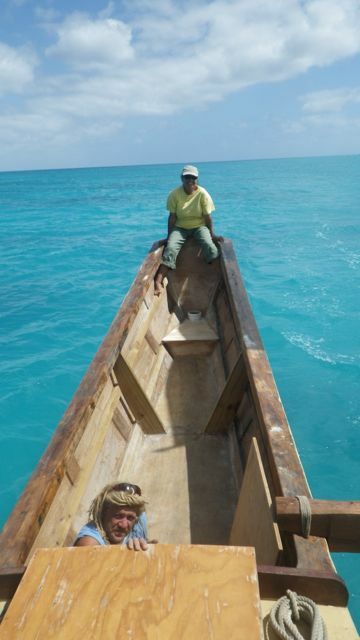 Ken is responsible for all the woodworking and carpentry that has restored the vaka. 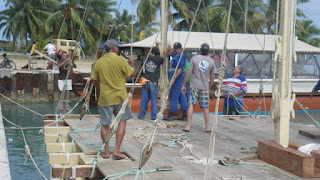 Shortly after launching (see previous post) a crew descended on the vaka to set up her rig. Here's how a bosun's chair works, Aitutaki style. The deck crew got everything organized. 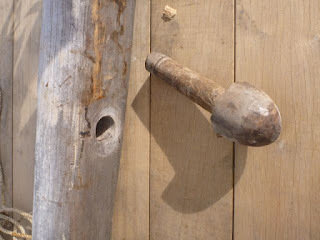 Note that on these vakas everything is done with lashings, which have worked simply and well for centuries. 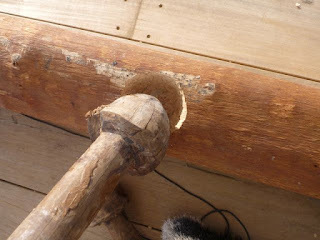 ... into a socket on the crossbeam, and it's all lashed together. The entire thing is so finely balanced that it pivots on the bearing, and can be easily manipulated by any enormously strong, very large person, which is not me. Below you can see how it's set up. The deck feels like an aircraft carrier compared to ours! Here's the happy crew about to raise sail for the first time in quite awhile. 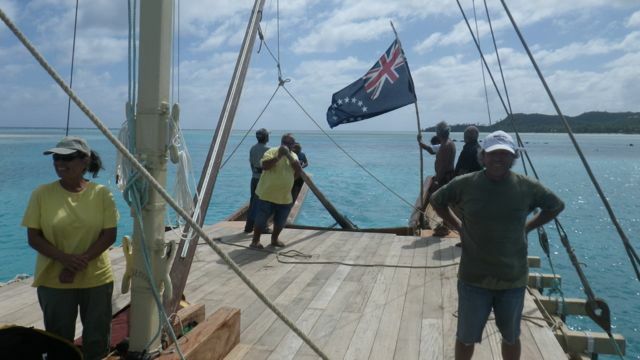 That's the Cook Islands flag flying off a bamboo pole astern. Standing at right is Ian Karika, brother of Ken and President of the Cook Islands Voyaging Society. He is also in charge of bird surveys, rat eradication and representing the Cook Islands at various international conservation meetings. Ian sailed Te Au O Tonga to Hawaii, and the man at the helm (Clive) sailed her to Maruroa and Fangataufa atolls in the Tuamotus 20 years ago, during the protests of the nuclear testing. Te Au O Tonga took off across the lagoon like a shot. These vakas can really move--10 knots is common. And there's no heeling! Piles of stuff stay right where you put them, not something we can say about a monohull. We dodged coral heads all day, but with a 2-foot draft it wasn't that difficult. In the foreground of the photo taken from the bow is one of many blocks that serve as turnbuckles, or attachment points for the rope rigging that holds the masts up. 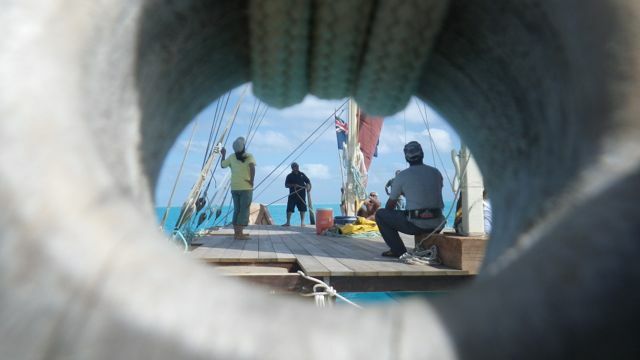 Here's an artsy view through that block, of activity on deck, which was vigorous at times. Gybing is much easier than tacking this vaka, as long as you control the 2 booms. It would be easy to break a boom if you don't. 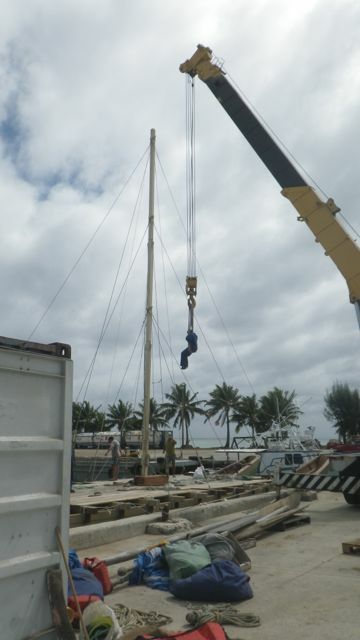 Each sail has an outhaul on the boom plus a halyard, and each boom has a single set of lazy jacks for lifting it around other rigging during gybes. Jim tries steering. 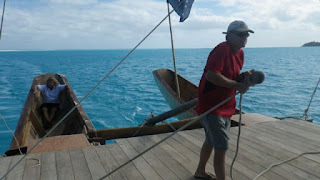 You have to wrap a rope around the steering oar to control it, and that can be heavy work. On voyages, the crew on deck relieve the helmsperson every 15 minutes. 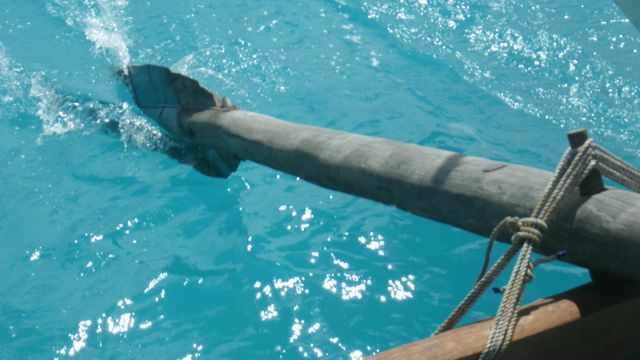 Here's the cool part: if you lean hard on the oar it will lift the blade out of the water; whenever you do that, the vaka begins to turn to windward. Then you let the oar bite into the water again, and she straightens out. 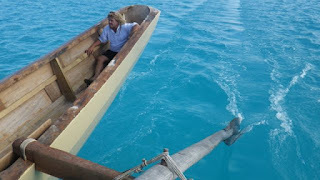 Not only that, but when docking without an engine the crew moved the steering oar so deftly that they turned this 74-foot craft almost in her own length. Ian told us that most of the time the vaka will steer herself if her sails are balanced. Just so you know, flip-flops are the perfect vaka boat shoe. 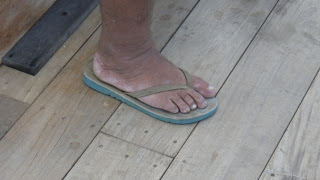 The owner of this foot did most of the steering, in case you haven't guessed already. The steering oar in action. A beautiful thing to see. We sailed for 4 or 5 hours, back and forth across the lagoon past the Prime Ministers and Presidents of most of the Pacific nations, and we were all so happy to be there, happy to have helped, and proud to be part of Aitutaki putting on an island-wide show that dazzled them all.